Miss Sophie helped me with the drawing for the Clover Needle Threader this morning. Please forgive the dark pictures - it's a very rainy, gray day here in the PNW. 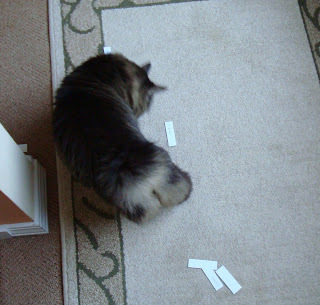 We did a scientific drawing by throwing the names on the carpet and having Sophie point to the winner. CONGRATULATIONS to Marla! Please email me with your snail mail address so I can get your treat mailed to you! Miss Sophie and I hope you enjoy it! 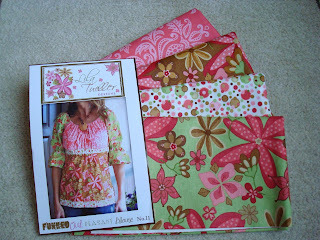 This is what came in the mail yesterday from Hancock's - Lila Tueller's Woodland Bloom fabric. Isn't it gorgeous? I've had her Funked Out Peasant Blouse pattern for some time - but I really wanted to make it as shown - these are good colors for me - so I had to be patient and wait until the actual debut of the fabric. Ahhhh, but first this weekend I plan to get many more of my Christmas Cottage Blocks done! I am sure the winner loves your kitty. Congrats to her. I have a few more touches to put on my cottages and I will done. Hope to have them in the mail on Monday. I bought that pattern too but of course haven't made it. At least you have fabric and your getting ready. LOLOL I love that top.